Louisiana, Land of Dreamy Dreams, where we treat the Mississippi River like our grand odalisque. Constrained by love till feeble on top while stirring below, The River has run off with some giddy television weatherman leaving our crops dusty and the low lands flooded. Amtrak-ing over the Huey P. Long Bridge at New Orleans, and the numerous Atchafalaya Basin bridges leading to it, it is clear how only the sturdy old Huey is up in the air enough to be untouchable by floods. At Morgan City, the Atchafalaya River lapped over bridge pylons within a few feet of the tracks. Amtrak's Sunset Limited came to a full stop, then proceeded very slowly across. The flood gates, downtown, were closed and water trickled under them, as Amtrickle trickled past. Upriver, on the Mississippi, the Bonnet Carrie Spillway gushed over a little-developed recreation area on its flood-way to Lake Pontchartrain. In Acadiana, the Atchafalaya Basin filled with Mississippi River water tumbling out of the Morganza Spillway, above Baton Rouge, threatening homes, settlements, even towns, on its way to Morgan City, its big iron bridges, and The Sea beyond. The train's conductor said, "You may not be able to come back this way." We bought round-trip tickets anyway. Saturday night in New Orleans. At the Vincent Mann Gallery Royal Street reception for Francoise Gilot, New Orleans once again demonstrated its ability to rise from gutter or flood. Outside, levees groaned. Inside, we partied as if God put us here to do just that. Lafayette, Cajun Spice Jefferson Street Gallery owner, Melissa Dronet, said she was not staying through the weekend. "Going back while the bridges are still up?" L. A. Norma asked. No one expected any bridges to come down. Not the big ones, anyway. Norma and I are banking on the Sunset Limited running, and the Morgan City bridges holding. At least till after we pass. And there is no problem with the Huey P. Long. Huey built it so well -- with Standard Oil's tax money -- that today the Department of Transportation is hanging four new automobile lanes over its sides. Huey P. Long is reputed to have told oil executives slow to contribute to his campaign, "What you get if you wait too long is good-government." They waited. Long taxed. In an unrelated event, one day while Standard Oil was out of town, someone murdered Huey in the lobby of the new Capitol Building, which he had also built with their tax money. "Sometimes it pays to wait," L. A. Norma said. "Now they got new roads hanging off the Huey P., and Governor Lapdog Millionaire, too!" We were sidling along in the crowd shaking hands with Francoise Gilot. She signed Norma's catalog, then declined the next woman, saying her thumb hurt. "Besides, the paintings are all signed," Norma smiled at the lady-declined. At the Vincent Mann Gallery the next day, a sweet faced young saleslady told us, "We deal with French Impressionist collectors from throughout the region." "Picasso would have done her in oil," Norma whispered. We shake the hand of Gilot's Son (with Pablo Picasso), Claude Picasso, as an oval image behind Gilot's head is removed from the wall. The painting, along with the lady-declined and a gallery representative, disappeared through the crowd. Claude Picasso manages his Father's estate (and his Mother, as much as she, still ingénue mystérieuse at 90, can be managed). His life began in the ashes of World War Two, a time fading outside art galleries and museums. Francoise was 20 when she and Pablo met. She was having her first exhibition -- in German-occupied Paris! Picasso was already famous, and 60. Claude shares his Father's handsome head. He turns his attention to matters other than us. Francoise Gilot as A Bridge. From the gallery catalog, ". . . she has been a bridge between the heroic period of the School of Paris and the emergence of New York City as the new world center for contemporary art. While she has lived in New York and La Jolla, California, for many years, I believe that she has found a cultural home in New Orleans . . . I am pleased that the New Orleans Museum of Art possesses several works by Gilot." – E. John Bullard, Director Emeritus, New Orleans Museum of Art. After the gallery closed, Gilot and Picasso had dinner at Antoine's with gallery founder, Jacob Manguno and a few gallery friends and art collectors. Bob and Marilyn Tarpy of Lafayette were among this lucky number. "I've collected Gilot since 1972," Doctor Tarpy said. 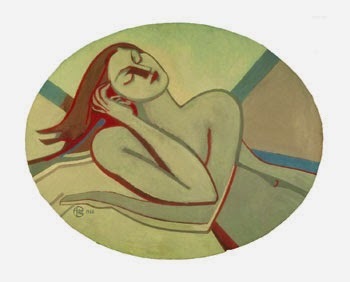 "We are all very proud of our work over the past forty years, bringing fine French paintings to New Orleans," Manguno said, "Francoise Gilot is one of the best." Francoise Gilot's footnote: The Mann Gallery has sold the master's work in the fancy neighborhood of five million dollars, since 1972. Claude Picasso's footnote: Manager, impresario magnificent. The Saint Charles Street Car was full of Tulane parents and friends-of-parents. Most of whom come from out of state. We met a few on the train into Town. "Our son is in the second post-Katrina class," one Father told us at lunch in the dining car. He meant the second class to form after Katrina. They formed in 2007 and are now graduating. Outside, thirsty sugar cane fields begged for a drink. Our table wondered about the levees, but talked more about restaurants. We recommended Atchafalaya Seafood, on Louisiana Avenue. "Louisiana's elite send their children to L. S. U.," L. A. Norma instructed, "to study connections and football. In that order." Everyone laughed. When we reached the Atchafalaya River Bridge, at Morgan City, the train stopped. Then inched across.